The Mar Thoma Syrian Church of Malabar is part of the ancient Christian community in Kerala, India founded by St Thomas one of the disciples of Jesus in A.D.52. The Church established links with the Church in Antioch and Syria and thus antiochean forms of worship were accepted in the Church of Malabar. Reformation in the Malabar Church was brought about through the missionary endeavours of the Church Missionary Society in London, which sent missionaries to Malabar. With this association with the Anglican CMS missionaries, Abraham Malpan and Geevarghese Malpan initiated reformation in the Church on scriptural principles in the 19th century. The Church maintains and preserves its essential character as an Eastern Church with autonomy, evangelical and Biblical emphasis, reforming spirit, episcopal heritage, its nature as a bridge church (between traditional orthodoxy of East and reformation of the West) and its focus on the place of laity. The Bethel Mar Thoma church began in December 1991 as a congregation in the Holy Trinity Anglican Church in Erskineville. It was started by a group of people interested in maintaining the rich traditions and heritage of the St. Thomas church in the new country. This was a joint initiative of the Anglican Church of Sydney and the Mar Thoma Church. The Bethel Mar Thoma Church started their worship services in the year 1991 and this is the 25th year as a witnessing community in Sydney. 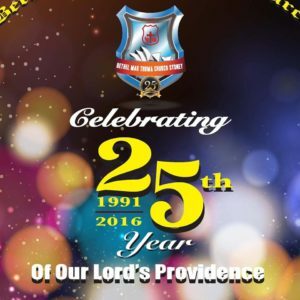 So it is with thanksgiving and great joy we are planning to celebrate this year as our Silver Jubilee year. The inauguration of the silver jubilee celebration was held on Saturday, the 5th November 2016 at the Parkside Baptist Church, (717 Smithfield Road Edensor Park, NSW) Sydney, at 4 pm.